The artist Nakagawa Kazumasa was born in Hongo, Tokyo in 1893 (the 26th year of the Meiji period). As a young man, he published his works of poetry and prose in newspapers and literary magazines, and showed his talent for literature. 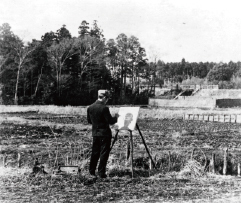 However, he became fascinated by the paintings of Vincent van Gogh and Paul Cezanne, which he discovered while reading an edition of Shirakaba, a literary magazine that he loved to read, and soon began painting. His first work, Sakagura(English title:A store house of Japanese rice wine), was painted in 1914, and was accepted for the Tatsumigakai Exhibition, a gateway to success for budding painters in those days. A year later, his second work, Shimonotokerumichi(English title:Frost thawing on the road), won second prize at the Exhibition and this encouraged him to make a career as a painter. Nakagawa then joined Soudosha in 1915, an artist association organized by the Tastumigakai Exhibition judge Ryusei Kishida, and developed his talent further by encouraging each other. In 1922, Nakagawa helped form the Shunyokai, a joint association of Soudosha and the old Western painting section of the Japan Art Institute, and contributed to the prosperity of the association as a leading painter. Nakagawa later built a studio in Manazuru, Kanagawa in 1949, where he had spent 20 years painting a landscape of the fishing village called Fukuura in the Manazuru peninsula. Around this time, he also painted landscapes of the Seto Inland Sea, Sakurajima in Kagoshima, as well as landscapes in Nagasaki, France, and Spain.In his later years, he changed his subject to the mountains of Hakone, and painted several magnificent views of Hakone’s Mt. Komagatake. One of his most famous paintings of Mt. 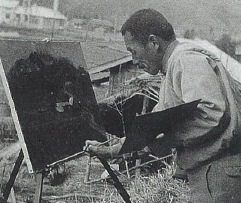 Komagatake was painted just before he turned 90 years old. It is a dynamic work in the later Nakagawa style, sized at 162.1 by 130.3 cm. In 1975, Nakagawa received the Order of Culture award for contributing to the Japanese art world as a leading painter for his entire career. He spent most of his final years in his studio creating still-life paintings, including several of roses and sunflowers. These still-life paintings, along with his other works, have continued to attract painting-lovers for decades. In his life time, Nakagawa tried many different art forms and did not limit himself only to oil painting. 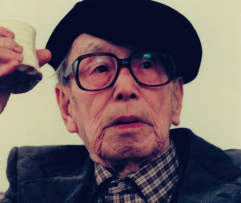 Some of his other best-known works include Suibokugansai, calligraphy, and ceramics. The artist Nakagawa Kazumasa expresses distinct originality in his paintings, such as daring brush work, vivid colour contrast, and a grand picture structure. These attributes of his work were established by adopting the deep spirit of the oriental art, and by believing in his own subjective representation. 1893 Born in Hongo, Tokyo. 1907 14 years old Enters Kinjo Junior High School in Kanda. 1910 17 years old His Tanka, a traditional Japanese poem, appears in poetry magazine called Sousaku edited by Wakayama Bokusui. 1911 18 years old His short story, Shiinoki is selected for newspaper called Yorozuchouhou. 1913 20 years old Publishes his Tanka in literary magazine called Waseda Bungaku. 1914 21 years old His first painting, A storehouse of Japanese rice wine, is accepted for the 14th Tatsumigakai Exhibition. 1915 22 years old Sends three paintings, Frost thawing on the road, Side of Prison, and Shojoshozo to the Tatsumigakai Exhibition; His second painting, Shimonotokerumichi wins second prize; Joins Soudosha organized by Ryusei Kishida. 1922 29 years old Helps form Shunyokai and joins the association the following next year. 1925 32 years old Publishes the translation Gogh with ARS. 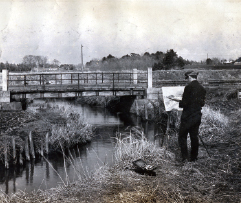 1926 33 years old Publishes a collection of paintings from Aterier Publishing Company. 1933 40 years old Draws illustrations for Jinsei Gekijo Seishun Edition written by Ozaki Shiro in Miyako Shinbun. 1938 45 years old Draws illustrations for Ishida Mitsunari written by Ozaki Shiro in the evening edition of Miyako Shinbun. 1943 50 years old Holds the Ishi Tsuruzo and Nakagawa Kazumasa Suibokuga Exhibition at Murin-an in Kyoto. 1949 56 years old Built a studio in Manazuru, Kanagawa; he is fascinated by a landscape of Fukuura. 1960 67 years old Holds a the joint exhibition at Nihonbashi Mitsukoshi with Nagayo Yoshiro, Mushanokouji Saneatsu, and Umehara Ryuzaburo; his work, Gyosongaifu is offered to Crown Prince’s Place through the Association of Prefectural Governors. 1961 68 years old Offers poetry (Titled Waka) for Utakai Hajime (first poetry reading convened by the Emperor of Japan). 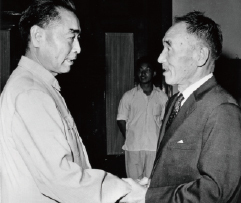 1964 71 years old Visits China as a member of Japan-China Cultural Exchange Association. 1967 74 years old Draws illustrations for a novel Tennonoseiki written by Osaragi Jiro. Begins to paint landscapes of Haone. 1975 82 years old Visits China as an honorary leader of Japanese Artists Party for Japan-China Cultural Exchange; receives the Order of Culture; starts writing for Watashi no rirekisho in Japan Economic Times. 1986 93 years old Publishes Nakagawa Kazumasa Collection (ten-volume) from Chuokoron Publishing Company; Nakagawa Kazumasa Memorial Museum opens in Hakusan, Ishikawa, his mother’s hometown. 1989 96 years old Nakagawa Kazumasa Art Museum opens in Manazuru, Kanagawa (Established by Manazuru City). 1990 97 years old Holds the Modern Japanese Painters Exhibition with Okumura Togyu at Carnavalet Museum in Paris, France. 1991 Dies of heart failure at Yugawara Koseinenkin Hospital.